It's a leap of faith to open up your primary home to paying guests. When I listed my family home on Airbnb while we were traveling, I had to accept the idea of strangers sleeping in our beds, snooping through drawers and closets, and perusing the shows on our DVR. I also had to accept the risk that something might be stolen or damaged. But most nerve-wracking for me was submitting my home to judgment. After each stay, guests are expected to rate my home on a scale of one to five, not just overall, but on cleanliness as well. Having your home and your hospitality critiqued on the Internet can be tough. The upside, of course, is the money. During one long trip, we earned enough on Airbnb to cover our own vacation lodging. Another trip paid for a new master bedroom set. The unexpected upside has been lessons — good and bad — that I've learned from the experience. I've been pleasantly surprised to learn that because we live in the popular San Francisco Bay area, we are able to charge up to $200 a night for a home that would have otherwise been sitting empty. And I was amazed to read that another Bay Area Airbnb'er is close to paying the entire mortgage of a house in the mountains by renting it out, and that fellow Wise Bread writer Mikey Rox bought a second home on his Airbnb profits. My husband and I are now contemplating adding a bathroom to the lower level of our house, with the goal of renting out that area as a studio, even when we are home. We hope the rents will help pay for the project. Before hosting guests who are staying a week or more, I like to provide an empty drawer and some closet space in each bedroom, and generally declutter the house so that the guests can use every surface without being encumbered by all the junk my family usually has around. I knock off to-do list items such as getting a leaky faucet or a sticky door lock fixed, and scrutinize my house for fixable flaws such as scuff marks on walls or grubby shower grout. Then of course, I need to remove and lock up personal documents and valuables. All this takes forever. Prepping my four-bedroom home for rental typically takes me about 40 hours, meaning that the rental wouldn't even be a very good hourly rate, except for the fact that we enjoy returning to a decluttered home after our trips. On the downside, we sometimes can't find things that I've boxed up and stored away while we were gone. Maybe we've just had good luck so far, but we have never come home to find that our home has been blatantly abused. Once I accidentally left a sheet of bank account passwords out — of all things! — and none of my accounts were breached. (Of course I changed all the passwords immediately.) We always have the house professionally cleaned before we return, but the cleaners have told us that the house is usually not terribly messy when they arrive. A few times, we have had guests stay in our home at a discount in exchange for caring for our cats. They're pretty low-maintenance cats, and guests have enjoyed having them around. All except that one lady, who texted me daily to complain about the cats and various other problems around the house. Her constant kvetching ruined our trip. In retrospect, I realized that although the guest mentioned above was probably just a complainer in general, one reason she was upset was that I had waited until the last minute to warn her about one potential behavior problem with the cats. She felt blindsided by that. On the flip side, we received one booking while the central heat in our home was unexpectedly inoperative. Not only did we get in touch to warn the bookers, we invited them over, since they were local, to check out the situation and determine whether the electric space heaters we'd borrowed were adequate. We gave them the option to cancel the booking, of course, but they opted to stay (at a discount) and left us a positive review. Despite the fact that people seem to have treated our home pretty gently, it seems some little thing is always awry when we return. A door will have stopped closing properly or a picture has been knocked off the wall and cracked. We've come to expect it as part of the cost of doing business. Some folks have left useful things in our house — the complainer left a small space heater, even though it was summer when she was staying — and since she never replied to my email asking if she wanted it back, we've enjoyed using it over the years. Others leave things that we don't notice until weeks later and then wonder where on earth it came from. Although we've never had anything stolen, it's very common to come home and immediately notice something is not in its usual place. Once I searched and searched for the dishpan I always keep in the kitchen sink, finally locating it in the backyard. Naturally, dishes that have been used and washed are often put away in the wrong places. These little things, while not harmful, can be unsettling reminders that others have been using your things while you were gone. Once I went to a bit of trouble putting together a nice gift basket for guests, with a fancy chocolate and a bottle of local wine. When we returned home, it was still sitting on the counter, untouched. The only explanations for this I could think of were the guests were non-drinkers or on a diet, or they didn't realize this was for them. Now, I always leave my guests an introductory note and specifically invite them to eat, drink, or use any of the things we've left for them. I also spell out house rules clearly, since things that might seem natural to us — like don't remove the dishpan from the kitchen — apparently aren't universally obvious. I've had a request to book my house for a school seminar — which I declined — and another from folks who are between moving out of their old home and moving into a new one. 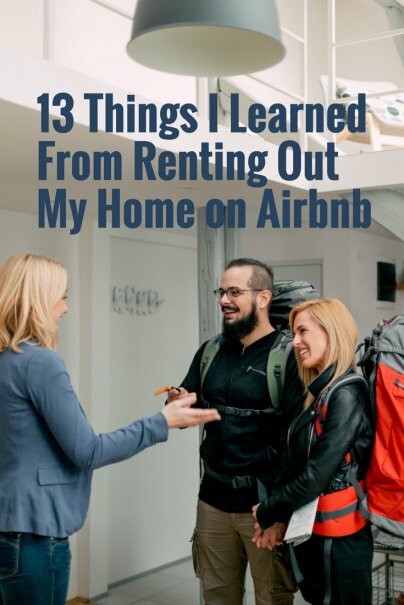 Since Airbnb encourages it, we typically hear from guests why they want to stay in our home, and it's kind of fun to learn that. Although our guests report positive experiences, we always get only four stars for cleanliness — despite the fact that we hire a professional cleaner to go over the house before they arrive, in addition to extra cleaning I do myself. This is a little embarrassing, but not that surprising when you think about it. Many rental houses are practically empty, with just a few cooking supplies in the kitchen. There's nothing in the closets or on the shelves to collect dust. Also, my home is almost 100 years old and the interiors are not up to date. Some surfaces are going to look a little dingy even when freshly scrubbed. Most of the people who book our house are families, sometimes multiple generations traveling together. They've told us that our listing is often one of the few houses with enough beds for them available. When I see full-time rental units on Airbnb, I often wonder why more of them don't put a bunk bed or two in a room to increase the bed count. Every time we rent out our house, we ask neighbors to keep an eye on things. We never request that they spy on the guests, of course, but we tend to hear about it if the guests say anything about our house to neighbors, or if they do anything weird like put out an excessive amount of garbage on trash day.